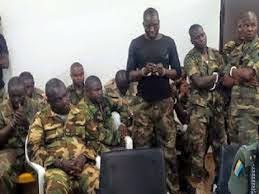 This is the 3rd article in a series of posts relating to offences under the Nigerian Armed Forces Act, the first was an article on the law on “Mutiny under the Armed Forces Act” while the second was about “Disorderly behaviour among Soldiers/Service men”. If you have ever lived in a military barracks, attended a military school or know a thing or two about the military, you will know the rule that the chain of command is unbreakable and anyone who breaks it, gets broken, lol. The chain of command or respect to seniority is sacred and it’s a big deal. Now imagine if a service man strikes his superior officer, wow, make we just talk say him own don end such soldier will definitely be disciplined. I attended a military high school, Nigerian navy to be precise and I remember a day I was beating for no reason by a senior student, I was so sure I didn’t deserve the treatment I got and angrily walked off to report the senior student to one of the military officers on deck. The military officer listened and asked me to go call the wicked senior, he berated the senior for beating me for no apparent reason and asked me to give the said senior 6 strokes from a horse whip. Oboy, did I gladly lash the senior’s buttocks. After acting out my vengeance, the military officer asked the senior to get up and said “this boy could come and report you to me because you did not beat him well enough, now take him away”. Immediately I heard those words, I knew it was time to draw up a will and last testament, I was definitely going to die, the senior student just looked and said “follow me” as he walked off to the senior dormitory. I didn’t die that day, obviously, else I won’t be typing this article many years after but let’s just say, I have never forgotten that experience and I doubt if I ever will. If my secondary school could be that devoted to the chain of command without minding if a senior student had killed me that day, imagine what it must mean to actually strike a superior officer in the military, serious gbege i am sure. “Any person subject to service law who strikes or otherwise uses violence to, or offers violence to, his superior officer; or uses threatening or insubordinate language to his superior officer, is guilty of an offence under this section and liable, on conviction by a court – martial, to imprisonment for a term not exceeding two years or any less punishment provided by the Act”. It states further in subsection 2 that a person convicted for the offence stated above shall only be liable to be imprisoned for no more than two years if the offence was committed on active service or involved the striking or other use of violence, to the superior officer exercising authority as such. A superior officer means an officer, a warrant officer or its equivalent in rank, non – commissioned officer subject to service law under the Act of superior rank, and includes an officer, a warrant officer or its equivalent rank,or non – commissioned officer so subject of equal rank but greater seniority while exercising authority as that person’s superior.